paul gregutt's washington wine blog – unfined & unfiltered: is viognier the 12th man of grapes? is viognier the 12th man of grapes? For football fans, especially Seattle football fans, the 12th man is an institution. It started some years ago when fans in the stands began doing The Wave, a rolling crescendo that rounded the old Kingdome. As the noise built and built, opposing teams found it more and more difficult to hear their signals, and the impact that the fans might have on the actual play became palpable. The 12th man – the fans – was born. Viognier has a sort of 12th man impact on many syrahs, by virtue of being co-fermented. When a percentage of viognier (generally five percent or less) is dumped into the fermenters with syrah, it improves color, adds floral and citrus accents, and enhances complexity. But as a stand-alone varietal wine, it does not seem to have found a home. Think about it. Does any region or country producing varietal viognier really claim it as their signature grape? Not to my knowledge. Here in Washington, viognier was first planted in Mike Sauer’s Red Willow vineyard about three decades ago. But as a varietal wine it didn’t begin to appear until sometime in the 1990s, and in terms of total production, it is still just a blip – 1100 tons last year – about the same as in 2004. That was the first year that viognier statistics were singled out, rather than dumped in the catch-all “other” category. Granted, there are a lot of producers making at least a couple of barrels of viognier. The most recent edition of my book lists more than two dozen that are recommended, and that number could easily be increased by another dozen today. Quality is improving, as vintners are finding the right balance, which has been a challenge with this grape. The most recent releases include many that harmoniously express the best flavors that the grape can offer. It’s reasonable to attribute some of that restraint to the cooler vintages of 2010 and 2011, which allowed the grapes adequate hang time without sending sugars to the moon. In any event, the problems I have noted with some Washington viogniers in the past (either searingly tart and bitter, or excessively volatile and alcoholic) are becoming a thing of the past. Candy citrus flavors mark this fresh, bracing, barrel fermented Viognier from the estate vineyards. Despite low alcohol and a hint of sweetness, it retains a crisp minerality, with a finishing lick of lime rind. Interesting scents of lemon and lime rind, orange liqueur, and peppery spice highlight this pleasing viognier, and the excellent acidity buoys it up through a satisfying finish. It should continue to improve for another two or three years. As with all Nefarious wines, balance is the key to success here. Whiffs of toast, smoke and sea breeze introduce a delicate, estate-grown wine with pretty melon, pear and apple fruit. Complex and graceful. Silky smooth, with scents and flavors of honey-laced flowers. Lemon, lime and grapefruit dominate the palate, with superb balance and persistence. Always a strong suit from àMaurice, the 2009 Viognier has a cocktail mix of lemon drop fruit and botanical herbs and spices. Pungent, bright and deliciously lively. A spicy mix of grapefruit, citrus rind, and Asian pear, with a wonderful mouthfeel, and a finish with cut, focus and length. A carefully made wine with gin-like spices and penetration. Lemon, lime and raw steel give it grip and length. Creamy and refreshing, this is a mélange of lime rind and flesh, melon and pineapple, with the crispness of a mountain spring. Beguiling aromas of rosewater, hard lemon candy, and fresh-sliced orange peel. The palate leans toward citrus, light but lingering, with a touch of minerality. A barrel-fermented viognier that offers appealing, toasty Meyer lemon and stone fruit flavors, coated in buttered nut goodness. A dusting of cinnamon gives it a French pastry finish. "Does any region or country producing varietal viognier really claim it as their signature grape? Not to my knowledge." Condrieu, my friend, is the home of Viognier, in the Northern Rhone. And the only grape allowed in the appellation. It wasn't that long ago that Viognier existed only in Cote Rotie and Condrieu. And though there are lovely Viogniers being produced in many places, few match the power of a Condrieu producer like Georges Vernay. Esteemed Hosemaster, of course you are right. But Condrieu is not varietally labeled, virtually disappeared not many years ago, and hardly qualifies as a signature wine for the Rhone. So I must stick to my 12th man analogy. 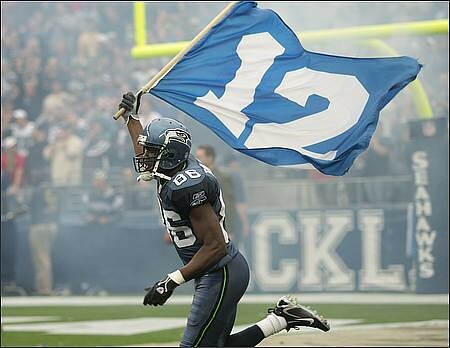 As a graduate of Texas A&M University I believe Seattleites should acknowledge that they did not originate the 12th Man. I love making Viognier, just as I love the Seahawks! It is finicky and hard to love, but when you can get it right, it's magical. Just waiting to make that perfect vee-own-yay just as I'm waiting for the Seahawks to win the Super Bowl! If life or work ever brings you to DC or Virginia, I encourage you to look for some of these. If you want to find Viogner as a signature wine then you need to look at Virginia. Many vineyards grow and bottle varital Viogner. The last one I had was from Flying Fox Vineyard in Afton, VA. It was varietally correct and the owner was very informative. Besides Condrieu, Virginia's signature white is Viognier, as the loose clusters help airflow in the humid environment. I totally get that Virginia = Viognier! I try not to make blanket pronouncements, which is why I wrote "Does any region or country producing varietal viognier really claim it as their signature grape? Not to my knowledge." Not to my knowledge. Knowledge now adjusted. As for denying linkage, that was never my intent, nor was it stated as such. I was writing specifically about varietal labeling. I am well aware that it is very New World. I am not "caught up" in it; I was simply commenting on it. Varietal labeling has its plusses and its minuses, no question about that. So now I will give Virginia its due as the Viognier capital of the New World. It's up to Virginia to get its wines distributed here on the Left Coast. When that happens, I will be delighted to write about them. If life or work ever brings you to DC or Virginia, I encourage you to look for some of these." Dave - will do! Thanks for the comment. Well, I've been making Virginia Viogniers for 20 years (Well, there was a 12 year hiatus when I was making wine in California and Oregon). Several of them have been sold in that big state out on the Left Coast (California). One (1993 Horton Viognier) has long been considered the US benchmark for the varietal. Can't believe no one has mentioned the Viogniers of Paso Robles, Ca. There are many producers there and many of the wines are really good. Some of my favorites in fact! What are your thoughts on the 2011 Tertulia Cellars Viognier? I have not yet had the 2011 Tertulia. Morgan Clendenan of Cold Heaven Cellars in Buelton, CA (Paso area) makes four excellent Viogniers. Worth seeking out.